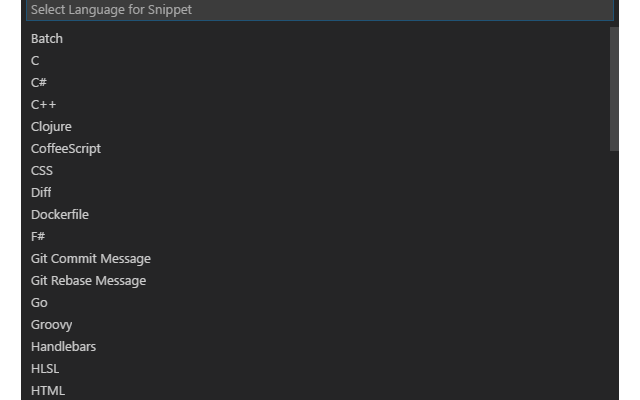 Visual Studio Code Snippets are definable templates that write boilerplate code for you. In addition to inserting boilerplate code, snippets have an interactive quality that allow you to push code out quickly. Select the language that you would like to add a snippet for and Code will open a file entitled [your-language].json. This file contains a JSON structure for defining our snippets. Mocha describe is the name of the snippet. desc is the text that will show up in my intellisense for the snippet. body an array of strings that will be inserted into my code when I execute the snippet. Also, there are a few $[number] symbols in the body of the snippet. These symbols instruct the interactive aspect of the snippet. When I execute this snippet my cursor will be placed at the $1 symbol. After I enter some text there I can the TAB key and my cursor will be placed at the $2 symbol – and so on. Once you are done editing [your-language].json, save and close the file. Personally, I tend to be pretty conservative with the snippets that I create. I think there is such a thing as “customization / configuration fatigue”. That being said, snippets like the one above are part of my daily development flow and I appreciate the speed they give me. What do you think? Do you have a favorite snippet?